As I read Donald Miller’s A Million Miles in a Thousand Years, I couldn’t help but sit there smiling the entire time. Sometimes it was because Miller is hilarious, but most of the time it was simply because what he wrote was so very familiar. When his book Blue Like Jazz was taking the world by storm, I heard so many people talking about it but never picked it up. I’ll have to change that now, because – as I should have assumed when my writer friends were also raving about the Storyline Conference – Donald Miller is a story genius. For A Million Miles in a Thousand Years, he tells the story of Blue Like Jazz becoming a movie. It was an interesting experience, as you may imagine, to watch people analyze his life as they made a movie from it. In the process of looking at “the fictional Don”, he realized that the kind of life he wanted – the kind worth writing and reading about – was something he could actually strive for. The book probably isn’t for everyone, but the reception of Blue Like Jazz makes me think that the general public likes Donald Miller’s style. The conversational tone of it made me feel very comfortable, but I’ll admit there were lines and paragraphs now and then that were a little too poetic for my liking. If academic trumps conversational (and at times downright flowery) for you, just be aware you won’t love every word. Read it still, because I think you’ll love most of it – and because it’s a powerful, inspiring message. The book is overtly religious, but more about God as a masterful creator than about Christianity and Jesus. I’ve heard some hesitate to call Miller a Christian author, because the gospel isn’t laid out in his books. In my opinion though, it’s perfectly fine to tell a story that focuses on and celebrates the character of a sovereign God who breathes life into his creation; to talk about a God who allows us – even creates us – to be creative, and to live a life worth living. “I feel written. My skin feels written, and my desires feel written. It feels literary sometimes, doesn’t it, as if we’re characters in books. Miller points out, “If the point of life is the same as the point of a story, the point of life is character transformation.” (Tweet that) But he doesn’t pretend you can just put pen to paper and create the life you want. He acknowledges that writing your own story sounds great, until it’s time to do the work. He talks through what the Bible has to say about fear, and how “we shouldn’t let fear boss us around.” He even begins to tackle why horrible things happen in the world, if God is still good. It’s really thoughtful stuff. 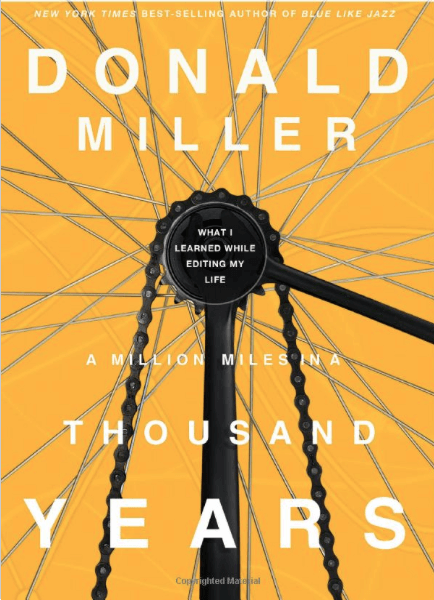 I think A Million Miles in a Thousand Years was the right Donald Miller book for me to read first. Now I can’t wait to check out others, and perhaps even watch Blue Like Jazz – but mostly because I love the artist who directed it. Have you read any of Miller’s books? What did you think?